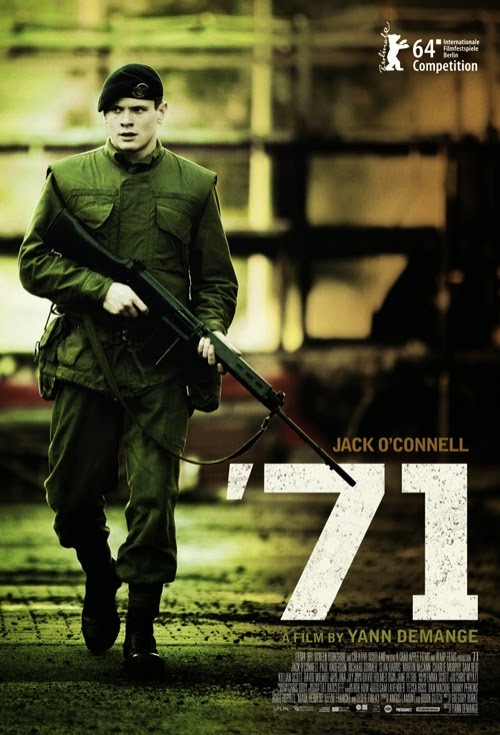 Despite the fact '71 was put together by newcomers to the world of feature films you wouldn't know it from the hard-boiled style and breathless pacing that enables it to become an intriguing tale of a single soldier. Led by Jack O'Connell (Unbroken) this is not the movie you might expect given the promotional material or even the synopsis. Instead, this is a veritable history lesson that breaks an event down to its most human element. To give you a sense of just how basic the film gets is to know that within the first twenty minutes our main character is holding bits of one of his comrades brains in his hand. There is a close-up of this. It quickly reiterates to O'Connell's Gary Hook how close he is to death, that separating him from the unknown is simply how fast he can run from those who have killed his mate. It is his immediate reaction to flee the scene that sets him on a course for a night of unexpected challenges and consistent life-threatening experiences that test his will to live and his faith in mankind. These larger themes are hinted at, sure, but only if you choose to take them away from the film. The beauty of this rather simple tale though is that, if you wish, you can take it as it is and for what it offers in its most basic of senses with that being a historical action film that just so happens to genuinely strike a chord. While there isn't much to it other than atmosphere and performances director Yann Demange has managed to pull out the details of this ongoing divide in Northern Ireland to create a compelling study of humanity that speaks volumes about the larger situations at hand. 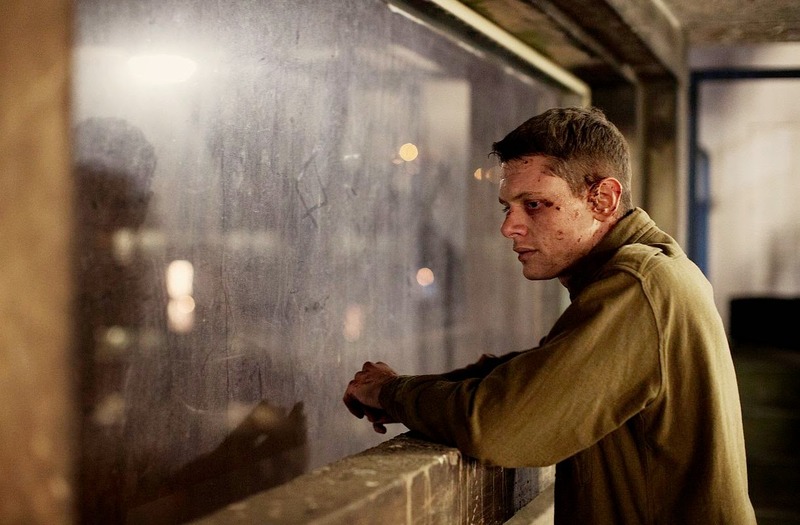 While O'Connell does fine work as a British soldier cut off from his unit and left to survive alone on the streets of Belfast it is the films ability to manage the multiple storylines going on within the different mindsets and allegiances that really stands out. And while I enjoyed '71 more than enough to recommend it I still can't say it struck me as something exceptionally substantial, but more as something of note due to its attention to The Troubles, an issue I didn't have much knowledge of prior to seeing the film and something I imagine many others on this side of the pond will have in common with me. In essence, '71 is something of a chase film, a throwback to films of the era in which it takes its title where the cinematography feels as brutal as the actions taking place on screen. The aesthetic of it all screams a grimy reality and it is within this world that we are introduced to Hook as a new recruit in the British Army. Under the leadership of the inexperienced Lt. Armitage (Sam Reid), the squad Hook is designated to are assigned to a hostile area of Belfast where Catholic Nationalists and Protestant Loyalists are living side by side. The unit provides support for the Royal Ulster Constabulary or the police of the area as they inspects homes for firearms. It is shocking both to the audience and Hook the extent of which these civilians, including women and children, are treated. Having seen the cavalry come rolling in the Catholic neighborhood begins to gather in protest and provoke the British troops who are only able to respond by trying to hold the crowd back and not with any type of excessive force. As the crowds become more infuriated and tempted by the solidarity of the British soldiers a young child crosses the line and pulls a gun from the grasp of one of the soldiers. In another gut reaction, Hook and a fellow officer follow the child as the growing crowd's protests begin to escalate towards throwing rocks and other physical acts that break the barrier of simply yelling in the soldiers faces. So as not to incite the riots any further the soldiers and police pull out, leaving Hook and his comrade behind. When they are quickly discovered on the literal wrong side of town they are descended upon by the locals and beat within an inch of their lives: Hook narrowly escaping with his fellow soldier on the receiving end of the scenario I described earlier. From here, it becomes a game of survival as Hook sneaks through Belfast at night in hopes of finding enough compassion to make it out alive. Gary Hook (Jack O'Connell) is put through one hell of a night in '71. As the lead, O'Connell is able to do here what he was stripped of in his most high profile role to date. While we never really got to know the Louie Zamperini as portrayed by O'Connell in Unbroken, but more went on a journey with him as the surrogate rather than getting any inclination of why his characters spirit supposedly took after the title, it is refreshing to see a performance from the young actor that justifies the early praise he's been receiving given I still haven't seen Starred Up. As Hook though, what O'Connell actually brings to the role that is tougher than making it stand out is downplaying any distinctive feature and being rather bland for the sake of making a point. While we get to know little bits of Hook's life; mainly concerning how much of a willing and able fighter he is and that he is a caring older brother while revealing the sensitivity a man of his position when the film breaks his situation down to those most human of elements it is mainly understood that this guy is a soldier first and is conditioned to do as he is told and will do so despite consciously knowing the lines between right and wrong rarely exist in such a conflict as the one he's involved in. To this comes an interesting take in that the film not only focuses on the covert intelligence agency chasing after our main character or the conflict of interests at play between this covert group and the official military forces on the scene, but that it digs into bigger themes of war in just how much this single mans life is worth. Is it him individually or more what he stands for that causes the ruthless opposition to seek his blood despite the fact his death would signify little more than the most minimal of victories? On the other end of the spectrum is the question of how much a single life is worth during a time of war? This question has been asked time and time again on film while here it resonates due to the fact Hook is so clearly a small piece of a larger puzzle and yet we desperately care about his well-being. The substance is there if you choose to look into it, otherwise '71 could simply serve as a gripping and solidly directed action thriller because it is most definitely that.